What is the difference between /etc/profile, ~/.profile, ~/.bash_profile, ~/.bash_login, and ~/.bashrc? Why doesn’t Terminal.app read my ~/.bashrc on Mac OS X? When Bash is invoked, it reads and executes commands from its startup files to set up the shell environment. Am I a login shell? Am I an interactive shell? When you login to a system, the first process spawned under your user ID is usually an interactive login shell. Normally there is some configuration that should only happen once when the user logs in, and Bash provides this capability by sourcing login specific startup files. First, the login shell sources /etc/profile, if that file exists. Next, it looks for any of the following files in this order: ~/.bash_profile, ~/.bash_login, ~/.profile. If it finds one that exists and is readable, Bash sources the file. Bash will also source these same files if the shell is started as a non-interactive login shell when started with the --login option. 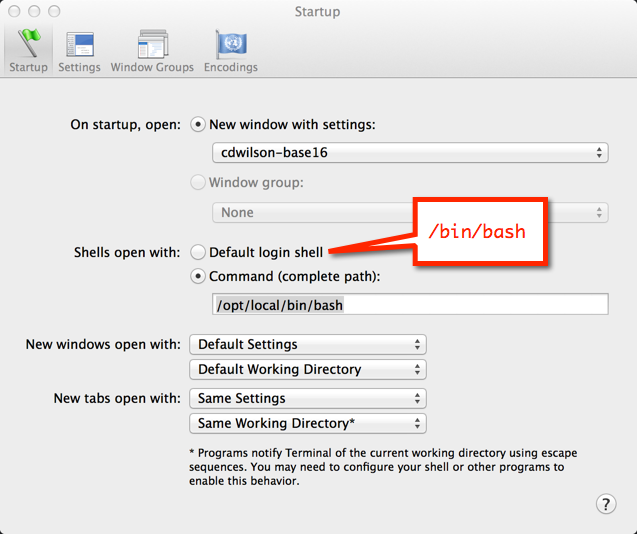 Additionally, before a login shell exits, Bash reads and executes commands from the file ~/.bash_logout, if it exists. Once the user is logged into the system, additional shells can be started within the existing session (for example, from the command line or started with a terminal program like xterm). These are usually invoked as an interactive non-login shell which normally inherits the environment from the parent login shell. However, since this is not a login shell ~/.bash_profile is NOT read when Bash is invoked. Instead, Bash expects settings for interactive non-login shells to be put in ~/.bashrc, so it reads and executes this file (if the file exists). If Bash is invoked as a non-interactive non-login shell (for example, to run a shell script), only the environment inherited from the parent shell is used (none of the startup files above will be read). In addition, it looks for the variable BASH_ENV in the environment, expands its value if it appears there, and uses the expanded value as the name of a file to read and execute. For examples of what should be included in each startup file, Linux from Scratch has a good tutorial at The Bash Shell Startup Files. An exception to the behavior above is when Bash is being executed by the remote shell daemon (rshd or sshd). When Bash is being run with its standard input connected to a network connection, it reads and executes commands from ~/.bashrc, if that file exists and is readable. It’s important to note that there are other conditions Bash checks which influence the startup behavior. For example, Bash can be invoked in a compatibility mode with the name sh to emulate the behavior of the sh shell. It can also be started in POSIX mode by specifying the --posix option. These and other startup modes are described in detail at Bash Startup Files. Since Terminal starts each new window as an interactive login shell, ~/.bash_profile is sourced while ~/.bashrc is not. Shameless plug: for an elegant way to manage these (and other files in your $HOME directory), check out home.